Thanks to the internationality of my school I will be able to taste a lot of dishes I probably never would have tried. 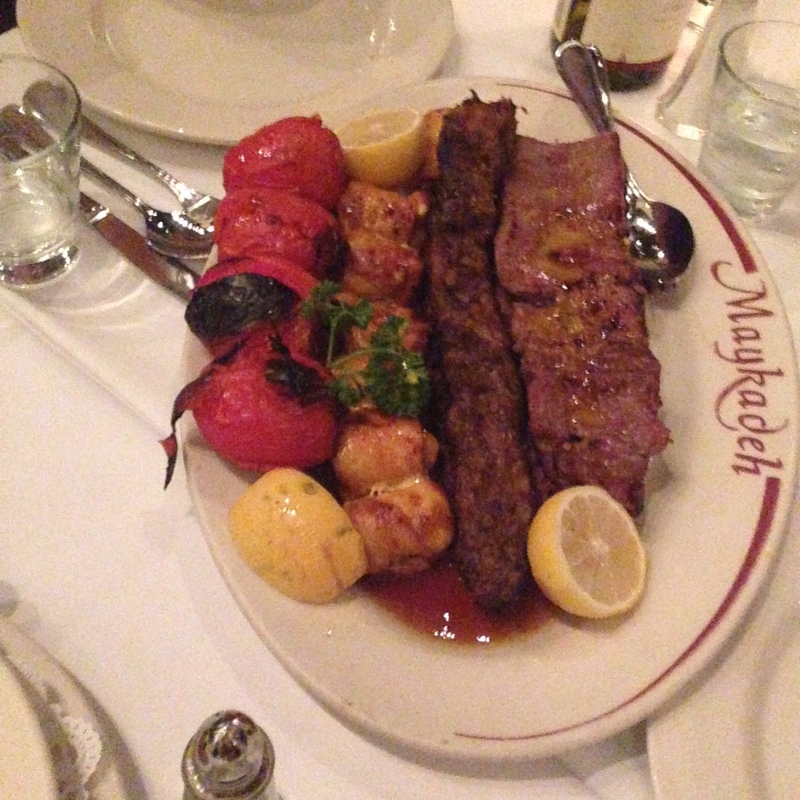 This weekend I was invited to Maykadeh Persian Cuisine on 470 Green Street. Our persian friend was very engaged to satisfy all our needs. He ordered appetizers to share for everyone (about 20 people). Those appetizers included warm bread, hummus, cheese, some veggie salad and incredible good eggplant creme topped with chopped crunchy bacon (if you like eggplant you have to try this!!). As a main course he ordered some saffron rice with a plate of meat – perfect for me, I love meat. As you can see here at the picture we had some chicken, lamb and filet mignon. The chicken was good but the filet was more my taste. It was really juicy and perfectly cooked. Unfortunately I cannot tell you about the lamb – I did not try since I am not a big fan of lamb. The taste for me is too strong. Some people enjoyed there dinner with wine and others with beer. I instead ordered a Persian Martini. I was kind of wondering about the description and the name because the Martini was made with Vodka :). Besides this it had some juices and fresh mint in it. I can really recommend it. At the end it was a bit pricey for about $35 per person but totally worth it. The atmosphere was very relaxed and the waitress very patient and caring. Even at the end when she had to handle 17 different credit cards.